Every time an inventory team walks a circuit, the leader returns with well over a hundred photographs. If there was a lot of animal sign, likely more than 200 pictures come back. These include photo documentation of every observation: primates, animal tracks and lots of animal dung. In fact nearly a third of any photo series is likely to be dung. Ashley has returned to Kinshasa for a week and I got him to lead me through some of the archives. 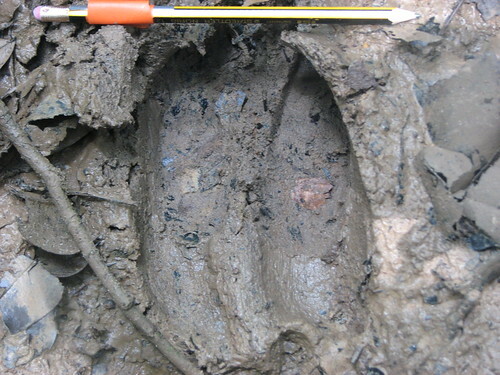 This week it is animal tracks – next week dung. 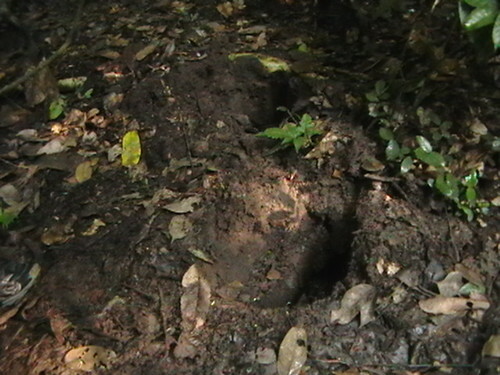 A buffalo track in a large savanna island in Maniema Province. Elephant tracks, a mother and her young, from Province Orientale. Hippo track near the Lomami River. 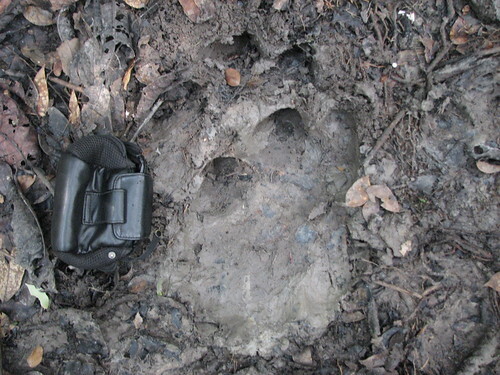 A bonobo left its knuckle prints in the mud of the forest floor. 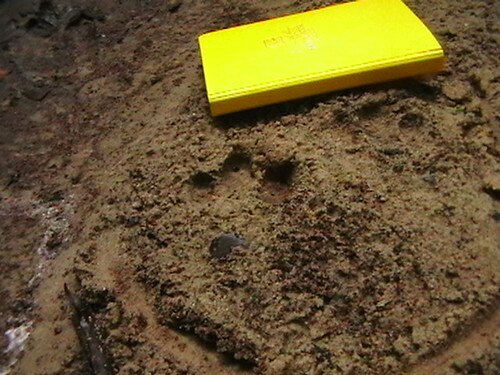 An okapi track in the basin of the Tutu River. An imprint today is erased in rain tomorrow. Our hope is that these prints will continue to be pressed again and again into the forest duff; that is our hope. This entry was written by Terese Hart, posted on 2008-10-04 at 12:18 am, filed under About the project, Guides and how to. Bookmark the permalink. Follow any comments here with the RSS feed for this post. Post a comment or leave a trackback: Trackback URL. the hippo is a surprise. 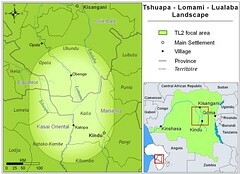 In DRC they are almost eliminated. Well there are not many hippos. We know of one place for certain and maybe another one or two hidden. Would be nice to have whole lot more really as they are important. No sightings. These hippos are wisely keeping well away from humans. THe question is how will they breed being so low in numbers? ashley,have you seen signs of hippo in salonga too? No, never saw any signs of hippo. Some good signs of elephants and buffalo in Salonga but oddly not hippo. I’m not sure if historically there ever were hippos (but I imagine so as the right conditions are there). 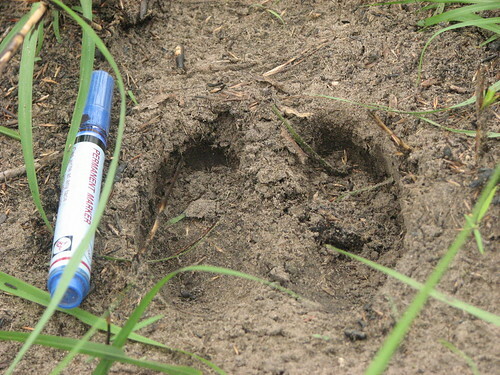 Actually i just remembered the guys pointing to some tracks and saying they were hippo but I’m not so sure. This was on the Lomela river right on the edge of the park in the northern part. I liked the Elephant track with the young one. what about okapis tracks. You should update the post to include those!